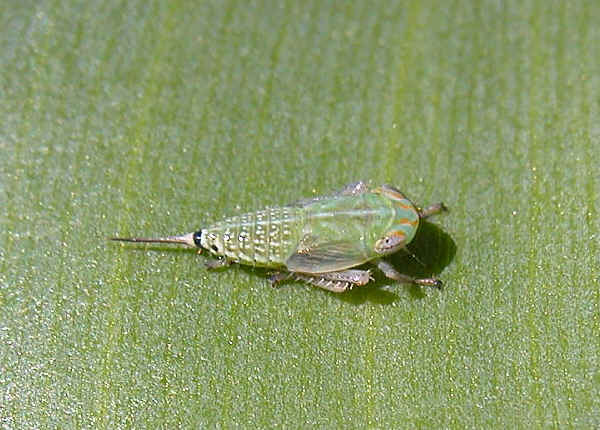 This page contains pictures and information about Leafhoppers in Subfamily Tartessinae that we found in the Brisbane area, Queensland, Australia. The leafhoppers in subfamily Tartessinae are usually wedge-shaped ranging from 2 to 12mm in body length. They have a distinctly heart-shaped pronotum. 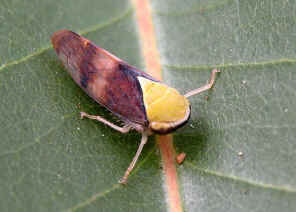 They may be found on leaf on tree trunk on host plants, mostly are eucalypts. 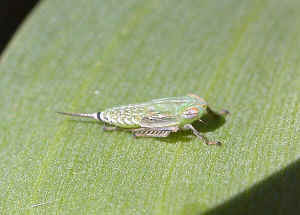 This four Leafhoppers were found on a large leaf near a pond in Wishart. They just rest, may be feeding, on the leaf. A couple of hours later, we came back and check the leaf, they were still there. 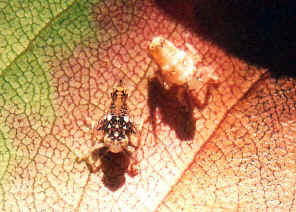 The second picture shows two nymphs, the picture was taken on late spring where we found adults and nymphs at the same tree. More information in this page. 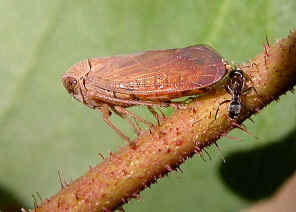 This Leafhopper is common on young tree stems in Brisbane Eucalyptus forest. 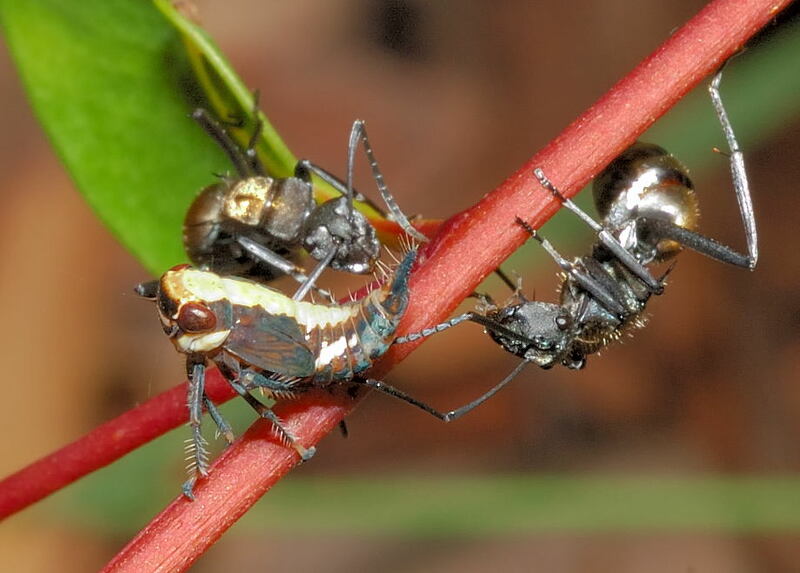 They are attended by different species of ants. 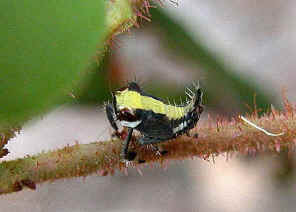 The nymph was found on the same small tree. We believe they are the same species, although their body colour were quite different. More information please visit this page. Pictures was taken in Ford Road Conservation Area on Dec 2008. 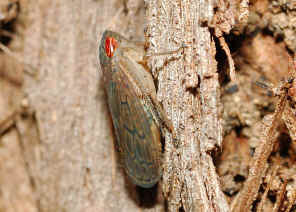 The leafhopper is dull brown in colour, with white dots on dark brown veins. Check this page for more information. Pictures taken in Karawatha Forest on early summer. We believe this is the nymph in family Cicadellidae. 1. Subfamily Tartessinae - - Fletcher, M.J. and Larivière, M.-C. (2001 and updates). 2. Tartessinae - Australian Biological Resources Study, Department of the Environment and Heritage. Last updated: August 20, 2009.